My current equipment consists of a lot of old mixed in with a bit of the new. I took some of my earliest digital astrophotos without equipment to guide the telescope, and this limited my individual subexposures to about 30 to 45 seconds. I slowly was able to adapt my old mount to use an autoguider, and this has allowed me to take longer subimages while maintaining better tracking accuracy. 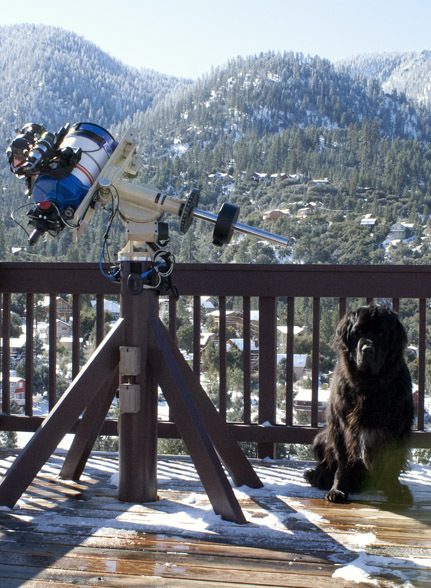 Focusing: Robofocus 3 electronic focuser for all telescopes and 200mm lens. Mount: 1984 Custom built Schaefer German Equatorial Mount with 7 1/2" Byers drive gear, one Hurst DC stepper motor on each axis (replaced original AC synchronous motors).